Have you ever noticed how whenever you visit a new doctor, you have to fill out a new medical history, longhand and on paper? Sometimes you make a mistake or sometimes someone else makes a mistake transcribing the information. Why can't the information be shared in a secure way? The same type of problem exists with computer systems, web applications, and passwords. If you frequently access multiple remote systems or applications, you invariably have to manage multiple user accounts. (At one of my past jobs, I actually had 17 user accounts across several systems. The killer was that the accounts all had different password complexity rules and expiration schedules.) What's happening here is that you have authentication and authorization information in different security "domains". What's needed in our internet and web-based world, is a standard way to securely (and easily!) share user accounts between systems. In other words, we need a way to perform "single sign-on" (SSO) between multiple security domains. What you want to be able to do is to have the different applications and sites that you rely on, regardless of each application's implementation or operating environment, to be able to safely share your login information, without you having to login repeatedly, or maintain multiple different accounts. One solution to this problem is the "Security Assertion Markup Language" (SAML). SAML was created by the Security Services Technical Committee of the Organization for the Advancement of Structured Information Standards (OASIS - http://www.oasis-open.org). Wikipedia (http://en.wikipedia.org/wiki/SAML) defines SAML as: '...an XML-based standard for exchanging authentication and authorization data between security domains, that is, between an identity provider (a producer of assertions) and a service provider (a consumer of assertions)...' Ref: Organization for the Advancement of Structured Information Standards (OASIS - http://www.oasis-open.org) Let's dissect that deceptively short definition into smaller pieces. Each of these pieces covers one of SAML's important characteristics and the motivations for its creation. XML based - One of the goals of the SAML is for it to be a standard that can be used by different applications and systems to replace proprietary security methods. If you're going to create a standard, then basing it on XML is a good start! Authentication and Authorization - These two aspects of security are related, but refer to different tasks. Authentication refers to verifying the identity of the principle. Authorization refers to verifying that the principal is permitted to perform a specific action. Security domains - "Federation" is an important concept to keep in mind when you talk about security domains. In the context of a political system, federation refers to the separating of overlapping of areas of control between the states that make up a greater federation. It may be that each state is able to make laws specific to the state, but they must also abide by the laws of the greater federation. (Ever hear of Fort Sumter? http://www.nps.gov/fosu/) It's like that when security domains are federated too. You might want to establish a large-scale domain for all your employees, so that they can all use the same login information to access multiple shared systems such as vacation trackers or a corporate intranet, while at the same time, you can establish smaller domains so that restricted groups of those employees can use that same login information to access purchasing or payroll information. Identity Provider - In the context of using SAML, an identity provider supplies authentication information when and where requested by a principal. Note that this in contrast to security systems that rely on cookies stored and supplied by the client web browsers, or ticketing systems such as Kerberos where the client supplies a ticket to a service. In SAML, a Identity Providers are the producers of security "assertions." Service Provider - In the context of using SAML, service providers rely on Identity Providers. When the principal requests its identity to be confirmed, an Identity Provider sends this information, in the form of a SAML sercurity assertion. So, in SAML, Service Providers are the consumers of the security assertions. But, while it is a standard, it is not an implementation. For a SAML implemention, we need to look at JBoss PicketLink. * Simple and Protected GSSAPI (Generic Security Services Application Programming Interface) Negotiation Mechanism - yes, that is a mouthful. 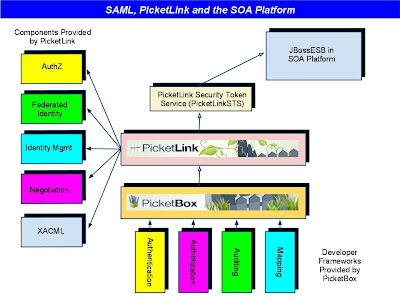 The SAML integration with the JBossESB in the SOA Platform is supported by the PicketLink Security Token Service (PicketLinkSTS). PicketLink provides login modules (https://community.jboss.org/wiki/PicketLinkSTSLoginModules) two of which JBossESB uses. 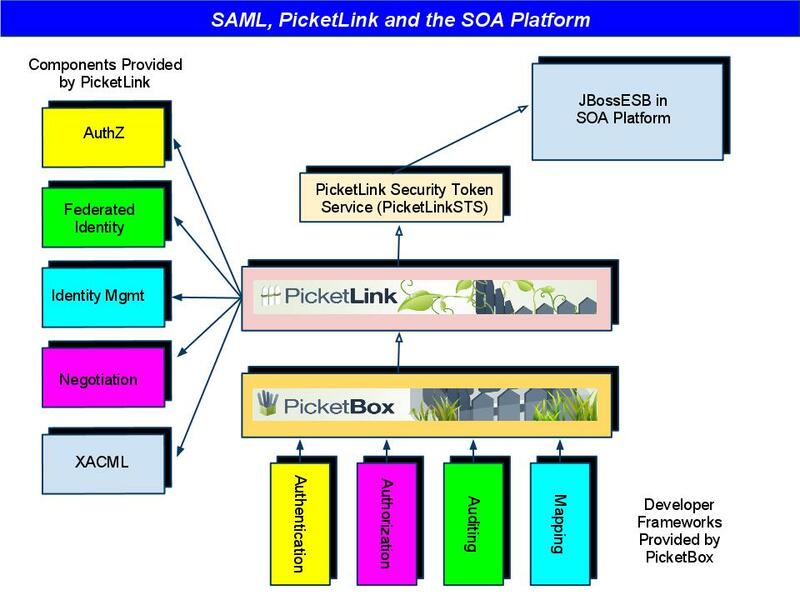 The primary focus of the ESB integration is for PicketLink to provide security modules and SAML Token support for ESB services. (http://community.jboss.org/wiki/JBossESBSAMLSupport) The ESB service configures the org.picketlink.identity.federation.core.wstrust.auth.STSIssuingLoginModule class to issue (produce) a SAML Security Token. The best way to look at this integration is to see it in action. So, we'll "learn by doing" by examining it in a SOA Platform "quickstart." Using SOAPProcessor to invoke an external Web Service that is secured by PicketLinkSTS. NOTE: We'll hop around a bit between these groups of files, depending on the relationships between the files. Let's start with the PicketLink's Security Token Service related files. The picketlink-sts-client.properties file defines the STS configuration for the STSIssuingLoginModule and STSValidatingLoginModule. Line 1 - The service name. Make a mental note of this as we'll come back to this in a minute. Line 3 - The endpoint of service. This will be active once we deploy the quickstart. Line 4-5 - This username and password are actually only used by the STSValidatingLoginModule. In contrast, the STSIssuingLoginModule uses callbacks to retrieve the username and password from the authentication request, which is extracted from the SOAP Security header. Where is the SOAP Security header defined? Read on. Like most of the SOA Platform quickstarts, the security_saml quickstart initiates its actions by generating a message that then is sent over the Platform's JBossESB to selected services. The soap-request.xml file defines the SOAP request that is sent. Lines 4-7 - These are the lines that we're interested in for this file. The "UsernameToken" security header information is used by the STSIssuingLoginModule as the username/credential for the user for whom a security token should be issued. Speaking of the STSIssuingLoginModule, let's shift gears and look at the "quickstart-specific-assemblies" ant target in the build.xml file. This target is called when the quickstart is deployed. Lines 6-11 create the .war file that is used to deploy the quickstart's target web service. We'll come back to this service in a bit. For now, let's look at the element on lines 13-17. What's happening here is that the login-config-unfiltered.xml file is used as a template to create a login-config.xml file that will be used by the quickstart's services. The processing of the element replaces the "STS_CONFIG_FILE_PATH" string in login-config-unfiltered.xml with the value defined in line 44. What's happening in this file? We're defining security domains. Remember how we talked about the quickstart demonstrating how to either issue (produce) or validate (consume) a SAML Security Token. Each has an applicaiton policy defined. For JBoss servers, security domains are configured with elements files named "login-config.xml." Line 2 - Here's the start of the domain that is used to issue the SAML Security Token. Line 4 - A reference to the STSIssuingLoginModule that we discussed earlier. Line 6 - The endpoint of the target web service is: http://security_saml/goodbyeworld - note that the endpointURI in STS properties is actually just the "domain" to which the security token will be applicable. Imagine you have two systems where access to one does not necessarily imply access to the other, yet they both want to use the same STS. You would look at the endpointURI to verify the token is for the relevant system. The system itself may include many web services that are secured as a collective. Line 7 - Each login module gets a shared map. When the "password-stacking" option is set to "useFirstPass," with this option, the login module looks for username/pass in that shared map instead of using the callback handler. Line 9 - And, here's the start of the domain that is used to validate the SAML Security Token. Line 16 - And here's the start of the domain that is used to validate the SAML Security Token. Line 20 - What's interesting to note here is the use of the "useOptionsCredentials" login module. Unlike "password-stacking," this option causes the login module to use credentials from its properties file. In the case of our quickstart, this is the picketlink-sts-client.properties file. In this context, "true" allows the login module to store the password in the shared map, in anticipation of its later use by another login module through "useFirstPass". Line 2 - As its name indicates, org.jboss.security.auth.login.DynamicLoginConfig enables us to dynamically deploy a security domain. In the case of our quickstart, the MBean makes use of the XMLLoginConfig service (line 4) and the SecurityManagerService (line 5). And the last of the security-related is the jboss-wsse-client.xml file. This file defines the JBoss WebService configuration that the quickstart client will use to access the web service. The configuration defined in this file will cover all requests sent by the client, and all responses received by the client. Note that this has really nothing to do with SAML/STS. The quickstart has configured the ESB service to support WS-Security UsernameToken, so that we can then use this user/password to authenticate against STS and request a token. Lines 4-6 - This config element indicates that all requests and responses must contain a username. When we examine the jboss-esb.xml file, we'll see that the JBossESB's SOAPProcessor (org.jboss.soa.esb.actions.soap.SOAPProcessor) is used to expose the web service's -endpoints. But wait, there's more! On line 15, we see this annotation: @HandlerChain(file="handlerchain.xml") A handler is a message interceptor to do processing of incoming and outgoing messages. SOAP handlers provide methods to access SOAP messages. A HandlerChain is a list of handlers. The handlerchain referenced on line 15 is defined as follows in the handlerchain.xml file. Line 6 - What's interesting in this file is line 6. The org.picketlink.identity.federation.core.wstrust.handlers.STSSaml20Handler handler class enables the quickstart to insert the SAML security assertion into the message as it is processed by the web service. There's nothing unusual here as the client simply sends an HTTP POST request to a target URL. How does this client get executed? Through this target defined in the build.xml file. Line 7 - OK. There's nothing unusual here either. Or, is there? Look at line #7. Where did port 9888 get defined? After all, the the server is running on port 8080. We'll find the answer when we examine the quickstart's jboss-esb.xml file next. The deployment.xml, jbm-queue-service.xml, and jbmq-queue-service.xml files all reference the JMS queues and topics that will be needed by the quickstart. The jbossesb-properties.xml file is used to define properties used by the quickstart and to over-ride server-wide settings. The file that we want to look at in detail is jboss-esb.xml. This file defines the quickstart's services configuration, including listeners and actions, and the providers. (Note that while we'll be examining most of the contents of the jboss-esb.xml file in detail, we'll be doing it in pieces or fragments so that it's easier to follow. The line numbers in each of these fragments will therefore be different from the actual (whole) file.) Let's start with the providers. As the name indicates, these elements define resources provided by by the ESB to the quickstart. Line 2 - Here's the start of the JMS provider. This is where we will see the definitions of JMS queues and topics. Line 3 - Note that each queue has a "busid" value defined for it. We'll see the busid's used in the service definitions in a moment. Line 7 - Remember how we discussed how each ESB-unaware queue required a corresponding ESB-aware queue to be defined? Line 11 - This is the definition for a JBoss remoting provider. This makes use of JBoss Remoting (JBR) into JBoss ESB as a transport option and supports HTTP (and SSL, which we're not using in this quickstart). What's interesting here is that the jbr-provider enables us to define the port (remember how we saw the reference to port 9888 in the "runtest" ant target in the build.xml file?) that the provider provides (pardon the pun) to a service. The remainder of the jboss-esb.xml file defines the quickstart's (3) services. We'll look at the configuration of the services now, and then we'll look at the actual operation of the services when we walk through what happens when we run the quickstart. Line 1- Service name and category are used to differentiate the services. Every service has a category and name attribute. JBossESB uses these attributes to register a service's listeners (gateway listeners or ESB-aware listeners) endpoints in a service registry. Line 2 - The InVM transport enables services to communicate using the same JVM and without having to go through a second non-gateway provider. This makes things more efficient as the services don't have use any networking protocols between JVM instances. The "GLOBAL" value indicates that the this service can be invoked using the InVM transport using the same JVM. Line 5 - Remember how we defined the appplication-policy name in login-config.xml? (Hint: The policy name was "saml-issue-token.") That's right. This is the moduleName. The callbackHandler defined here overrides the one defined in jbossesb-properties.xml. Remember that the username and password can be provided by a callback. In the case of this service the callback is JBossSTSIssueCallbackHandler. The callback handler retreives the username and password of the user for whom a security token should be issued. Line 7 - Setting the org.jboss.soa.esb.services.security.contextTimeout property to zero ensures that every time the service is invoked the security context is re-evaluated. Line 10 - Here's where the definition of the services listeners begins. These are well-named as they "listen" for incoming messages, based on the designated queue and protocol. Line 12 - Remember how we reviewed the "Http-1" busidref in the "providers" section of the jboss-esb file? Well, here's where it's used. The JMS queue associated with this busidref is "listened to" for incoming messages. When a message is received, the service's action pipeline (in this case a pipeline of only one action) is executed. The reference to "gateway" indicates that the message originates outside of the ESB and is passed into the ESD through this "gateway." Line 17 - The service's actions' definitions start here. The message exchange pattern (or "mep" for short) is asynchronous as the service will not wait for a response before moving on. Line 20 - We'll uncomment this line later on so we can see the security subject displayed in the server log. Next, let's look at the service to which the first service routes messages. There are two interesting lines in this service definition. Line 5 - In contrast to the first service, this service uses the org.jboss.soa.esb.services.security.auth.login.JBossSTSTokenCallbackHandler class as a call back handler. Line 18 - Routes the message to the next service. Lines 13-15 - This action invokes the Smooks script to inject the SAML assert into the message. Lines 17-18 - And finally, the target web service is invoked via the org.jboss.soa.esb.actions.soap.SOAPProcessor out of the box JBossESB action. But - hang on - let's examine in detail just what each command actually does. ant deploy Many of the quickstarts require some "set up" work in order to run. In the case of the security_saml quickstart this set up involves deploying not only the quickstart, but also the PicketLink Security Token Server (STS) .war file that is included in the quickstart. Here's the deploy target in the quickstart's build.xml file. Here's the server log when the quickstart is deployed. 23:04:13,844 INFO [JBossRemotingGatewayListener] JBoss Remoting Gateway listener 'listener' stopped. 23:04:15,870 INFO [CoyoteInvoker] Using org.apache.coyote.http11.Http11Protocol for http (coyote) invoker protocol handler. 23:04:15,871 INFO [JBossRemotingGatewayListener] JBoss Remoting Gateway listener 'listener' started. OK, let's run the quickstart and watch it in action! [java] Sent http post to server. Public Credential: SamlCredential[<Assertion xmlns="urn:oasis:names:tc:SAML:2.0:assertion" xmlns:ns2="http://www.w3.org/2001/04/xmlenc#" xmlns:ns3="http://www.w3.org/2000/09/xmldsig#"
And, notice what the quickstart did not have to do - it did not have to include a large amount of custom-written code to issue or validate the SAML Assertion. PicketLinkSTS and the JBossESB in the SOA Platform did the heavy lifting. As always, I want to thank the JBoss SOA Platform team and community (especially Anil Saldhana, Babak Mozaffari, and Kevin Conner for their timely review input for this blog post).